Stretch your Back for flexibility with these Back Stretching Exercises. Many athletes overlook them but they are real essential for back flexibility and Injury Prevention before Weight Training Workouts. Back Stretching is the most overlooked part of any sport, workout or even life. If you see how crucial Back Stretching Exercises are for overall flexibility and preventing Training Injuries you will be surprised why you never did them. Back Stretches are very important to avoid Sports injury, improve athletic performance and even alleviate muscle and joint pain. Back Stretches reduces Muscle soreness after an intense workout. Stretches reduces back pain and the risk of Back Injuries. Tense Back Muscles are only a point away from being injured. Take this advice from a professional here. Its best to perform Back Stretches before and after workouts. Also Back Muscle responds very well for stretches in between workouts. Its a tip from Arnold Schwarzenegger himself. Stretch your back as part of your overall body stretching everyday. Do not reserve it for your Back Training days alone. However you can stretch the training areas more than others but always get a general stretch as well. I cannot say this enough. Remember Back stretching is to make you more flexible. Stay away from the pain zone here as you do not want to unduly stretch your back too much. Just follow the guidelines mentioned here and you will be fine. Stretching Guidelines like when to stretch, how much duration and basics are mentioned in the Best Stretching Exercises Section. Make sure you read them. Although there a lot of Back Stretching Equipment available, if you are pain free and not undergoing any Back Rehabilitation then a few simple back stretches are enough for your back flexibility. For the purpose of this article we can break the back stretches in to Upper Back Stretches and Lower Back Stretches. You can perform them one after another calling it a total Back Stretching Workout. It is essential you loosen your neck and torso with these stretches first - Neck Rolls and Side Bends . 1. Sit on the floor with legs bent at your knees. Get knees closer to chest, and wrap your arms around your knees so that you clutch yourself tightly. 2. You can increase the stretch by bending your neck and bringing it closer to your knees. 3. Now rock back and forth, taking deep breathes all the while. You can transfer the weight from hips to feet and vice versa while rocking. This Stretch is just like the regular Stretches you perform. Most of us do a set or tow or chin ups before we begin actual training. Why not turn this in to a Back Stretching exercise too. Perform chin ups as you would regularly do but at the and hold at the bottom position fro 15-20 seconds. This will stretch you upper back and whole upper body. Forward Bends and Seated Forward Bends. Lie on your back with bent knees. Keep you feet flat on the floor. Place you hands under your buttocks and pull the legs closer to your chest. Feel a stretch in your back muscles and hold the stretch for 10-15 seconds. Return to start and repeat 3-5 times. Lie on your back comfortably on an exercise mat. Now cross your one leg such that the foot now is on top of the other knee. 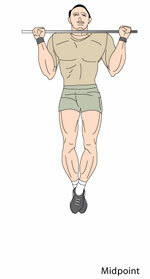 With the opposite hand pull the raised knee further towards the ground. Hold this position for 10-15s and repeat 3-5 times. For Stretching times, durations and other basics read Stretching Exercises - The Basics Section. Core Stretches - Lower Back Stabilizers and Erector Spinae Stretches. Spinal Twists, Hanging Stretches, Abdominal Stretches or Half Bridges.